Continuing our occasional series on the use cases that show the sophistication of our Intent Targeting Engine in action, I decided this week to take a look at the media and entertainment industry. This is an industry that has been at the center of a huge amount of change recently, particularly when it comes to video - or “TV” as long as we understand we’re using that term in the loose, colloquial sense. As the cable companies and channels that previously ‘curated’ the TV experience become less relevant, content creators now have the opportunity to create a direct relationship with the consumer. That ability to build relationships directly is a huge bonus, but it’s also a requirement. Consumers have more choice than ever before and as a result it’s no easy task to win their attention. Doing so requires delivering the kind of personal, meaningful communications that can only really be delivered when you have a clear understanding of the customer as an individual. That’s where the Swrve Intent Engine comes in. But rather than engage in the usual marketing hyperbole, in this series of posts we’re simply showing the types of audiences that can be built dynamically and in turn deliver the kind of campaigns I am talking about. Ultimately, audiences of this type are exactly where most marketing and communications teams end up - they aren’t an abstract ambition, but rather exactly the kind of audiences that would be created if marketing teams weren’t limited by the technologies they use. If you’re in the music streaming business, ensuring your customers get value from their monthly subscription (and as a result don’t churn) is a big deal. One way to make that happen is to remind users when there’s music out there they’ll probably like, but haven’t yet listened to. This audience does just that. 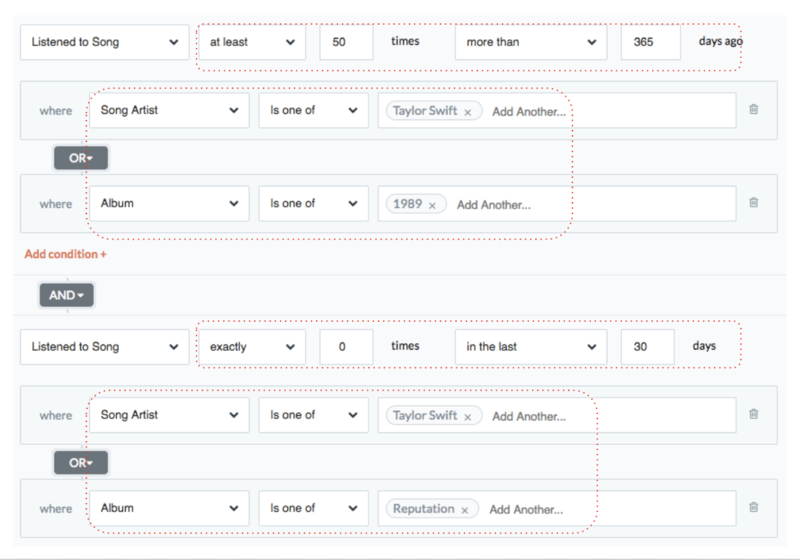 Firstly it finds all those users who have listened to songs by a particular artist at least a certain number of times (50 Taylor Swift songs in this instance). Of course we can also specify during which time frame this happened. As we might want to target people who used to listen to this artist, in this instance we’ve asked that all these plays took place over a year ago - although note, that doesn’t mean any keen Taylor Swift fans will miss out if they have listened in the last year. On that note, we will also want to remove from our audience anyone who has already listened to the new album (a step that appears to be beyond most of the music streaming services I am familiar with). One final note - as data in the Swrve Intent Engine is real-time, this query will deliver me an accurate audience at the moment I create and deliver the campaign. A classic example of a ‘helpful’ campaign that isn’t all about the bottom line, but rather providing a great experience for subscribers (which in turn, of course, translates to the bottom line eventually). Finding the right audience here is relatively straightforward. Firstly, we identify customers who have NOT watched a particular show - Game of Thrones in this case - in the past 3 days, although of course we can specify any time period we choose. It’s important to understand that although this sounds simple, the ability to not just specify ‘watched a show’ but instead which specific show is in fact rather sophisticated - particularly when there are effectively millions of combinations of events we might end up using. 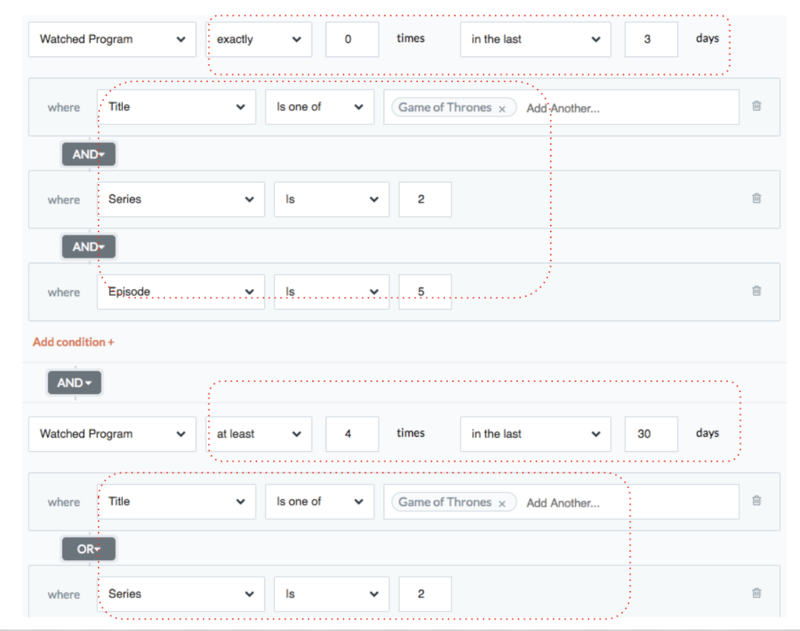 In fact, as can be seen in the example, we don’t just specify Game of Thrones as the show type, but also which precise episode we are referring to. Remember, the user may have just caught up with an older episode recently - not the one that we want to remind them about. Then it’s simply a matter of adding in the requirement that the user has watched 4 episodes of the current season in the past 30 days. In other words: they are keeping up to date with the show and are pretty likely to want a reminder that the latest episode is available and ready to view. Easy! It’s one thing to let people know that a TV series they are following has a new episode. But we can get smarter than that. The campaign below creates an audience based on viewers who have watched any given number of movies including any combination of actors we wish to specify (again, that is effectively millions of combinations). This ability to create audiences of this type is the ideal way to ‘cross-sell’ content and deepen engagement with individual users. And, of course, this isn’t limited to actors. Similar queries can be created based on genre, director, subject matter - anything that you can imagine (and that you use to categorize content). That makes for a very powerful active referral engine that provides value to the user and greater loyalty and engagement for the media business.